Welcome to your Alumni Association, class of 2018! You've relived the memories of Commencement through photos and social. Your degree is arriving in just a few short weeks, and you're ready to make your mark on the world. Your time as a student has ended, but your Binghamton University experience isn't over. President Harvey Stenger shook hands with more than 4,000 students on May 18–20, as bachelor's, master's and doctoral candidates crossed the stage. Stenger spoke of this year's tragic losses, observing a moment of silence at each ceremony, and spoke of the joy of the occasion. 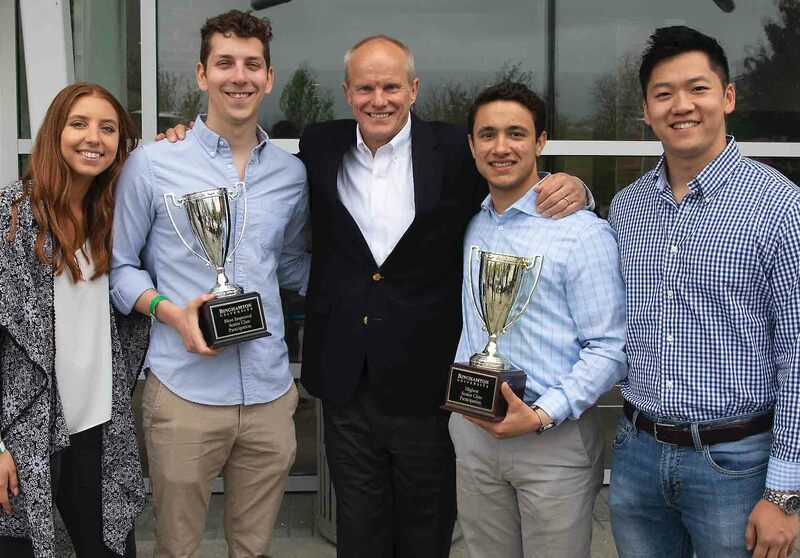 Students making an impact by giving back and having some competitive fun — that's the idea behind the annual Senior Challenge at Binghamton University. Graduating seniors are encouraged to support the area of campus that made their time at Binghamton special. When was the last time you were on campus? If it has been a while, come back for a weekend of celebrations. If you were here for a recent Homecoming, you know it's going to be fun. We'll have special celebrations for EOP's 50th, BSU's 50th, Decker's 50th, Harpur's Ferry's 45th and men's tennis. In our "Life After Bing" series, we bring you quick interviews with alumni who are leaders in their fields, trail-blazers. Find out how they got to be where they are now, and how Binghamton shaped their lives. Our featured alumna is Jessica Stanis, MSW/MPA '15. Though he had a positive student experience at Binghamton, after graduation, Rick Krisburg's '88, MBA '90 connection to the school was little more than speaking with students at the annual Metro Career Night — until about seven years ago.